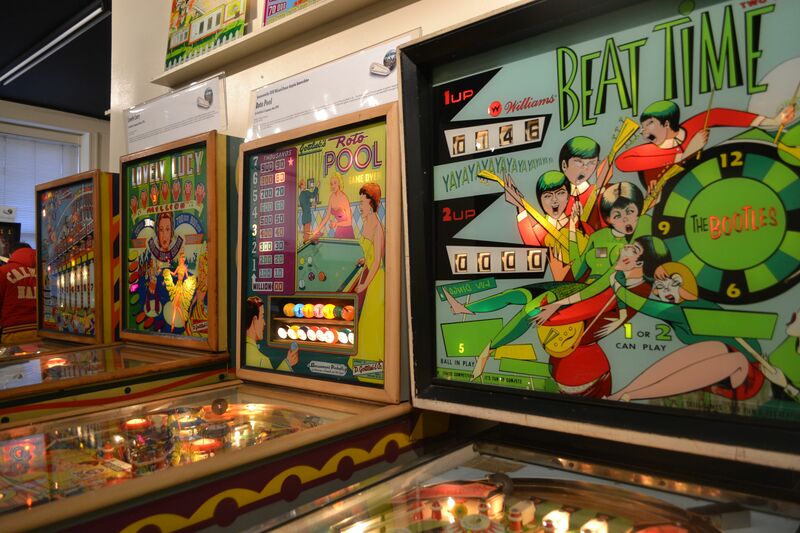 Last fall I was on the web researching the origins of Captain Fantastic Pinball Great and discovered that the National Pinball Museum was relocated from Georgetown to Baltimore. My question is that’s the best thing that has ever happened to that Museum. Get the hell out of D.C. Let’s just our fickle city embraces this treasure of great potential. In the same way the government muscle gets behind institutions like the National Aquarium and The Port Discovery with signage and fast track improvement through the bureaucracy, The Mayor needs to get down to the pinball museum for this place is a gem in the making, one of the true defining flavors that can keep Baltimore unique and dissolve into touristy schlock. On Saturday after an ice storm the kids and I made our way at the location at Power Plant for an afternoon playing the history of the silver ball. All I could think of if this place existed back in the day, it would have changed my life — I don’t know if that would have been a good thing. 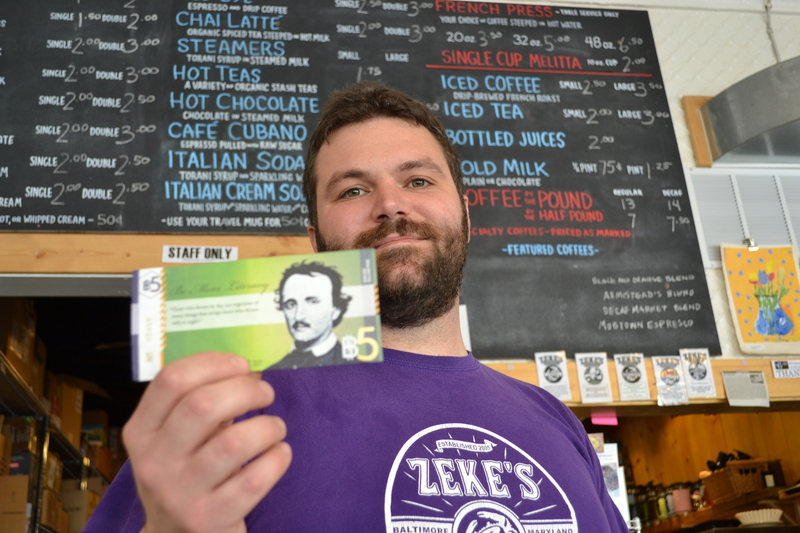 Twelve bucks got you a debit type card which you could swipe from machine to machine. By doing so I took time to notices the sublets between machines which wasn’t hard considering one point I could be playing a baseball game from 1952 to Ted Nugent 1978. It’s amazing to note the subtleties in the bells, the ruthless small flippers of the past the rush to heap all kinds of glitz a la The Guns and Roses machine of the 80s. I was digging all of it, the woodworking and the hand pumps from the early days to slim down elegance of the 70s.I recalled the moment when we were dazzled when machines started going out with electric light score keepers instead of the rolling numbers. The folks at the museum were cool enough to let my nine-year old slide without a card considering she wouldn’t be playing any games on her own. 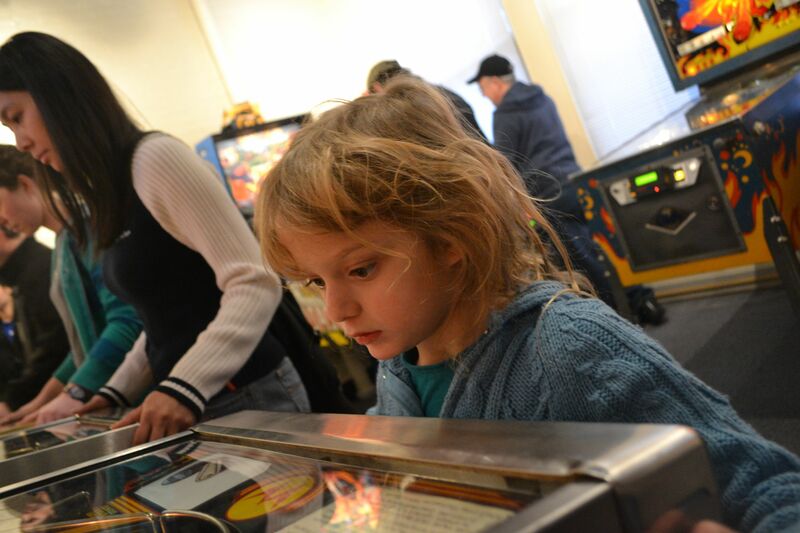 Being weened on Video and Computer, DS, pinball was a great leap for her and her younger sister. The only time they ever experience pinball was an app on my iTouch. They seemed to get a drawn in a bit, but in the end it was me who they had to drag out kicking and screaming. These pinballs after all we seen as the downfall of civilization way before Atari showed up. 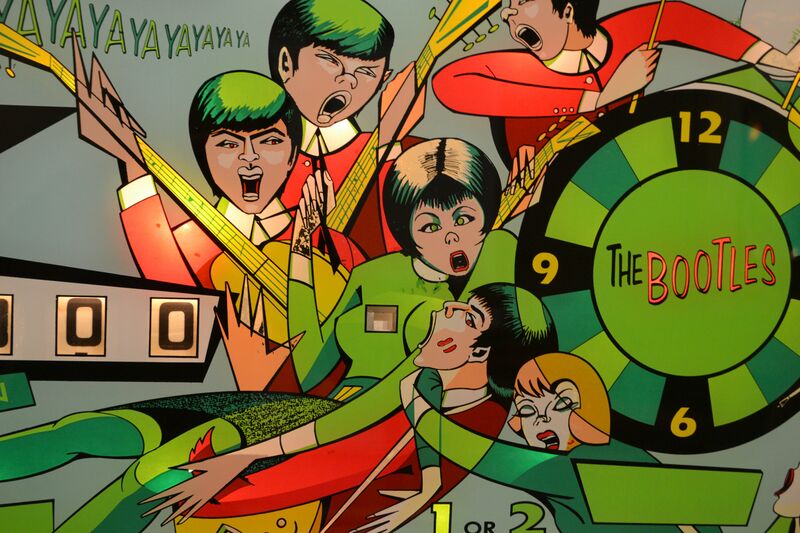 I tried to stave them off by telling them that maybe we could be regulars that after a while they would nail these games, just as repeated play makes them experts out of Wii, that they would emerge as pinball wizards kicking boys’ butts. But they weren’t having none of that and we scooted with still time on the card. But I’ll be back. Some of the cool games: Funhouse, The Creature of the Black Lagoon. Dirt Bike and the soccer. The display of the earliest, primitive models on the first floor was also impressive. The graphics by itself is worth the trip, every bit as influential as comics. Time 1.5 hrs. to 2 hr depending on traffic. When it comes to day-trips there lingers the urge to go back in time, but truly it’s gettig harder to do, mainly because we can’t help but mess with the few diminishing remains that we can still visit. We turn them in into museums or we build a gleaming visitors’ center in the middle of a bucolic enclave. We mess with the old ways, always updating and congratulating ourselves that changes have been camouflaged as historic preservation. Thankfully time, developers or a tourist onslaught hasn’t done a thing to Matoaka Cabins in St. Leonard down in Calvert County. Named after Pocahontas real name, Matoaka looks very much as it did back in 1960 when Larry and Connie Smith bought the waterfront bluff. Back then it was camp that dated to the 1930s. The place still has that vibe with its slapsided-planked cabins with the bowed screen porches, the dirt basketball court with the makeshift nets. 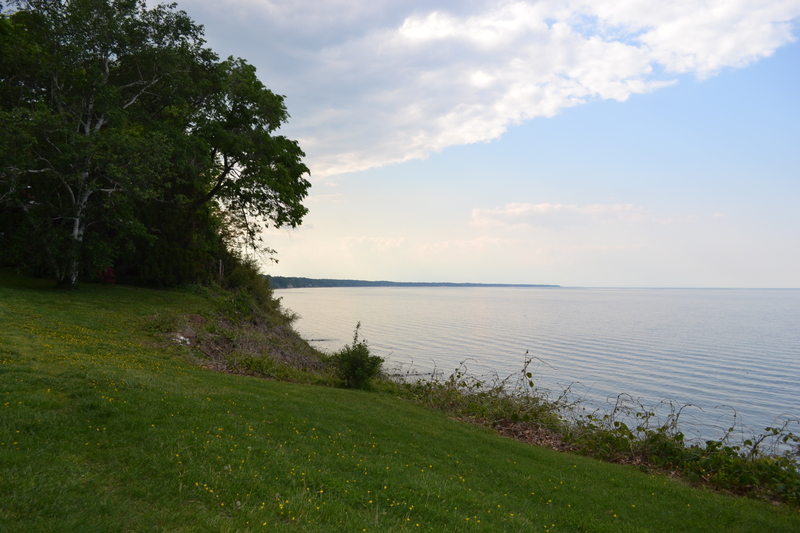 There isn’t any restrooms along the beach, perhaps an outhouse stands back up the long climb to the Matoaka Camp. Hey like I said it’s rustic. Despite the raw look of the cabins, the proprietors know they offer a rare opportunity to wake up under a wooded canopy overlooking the Bay. 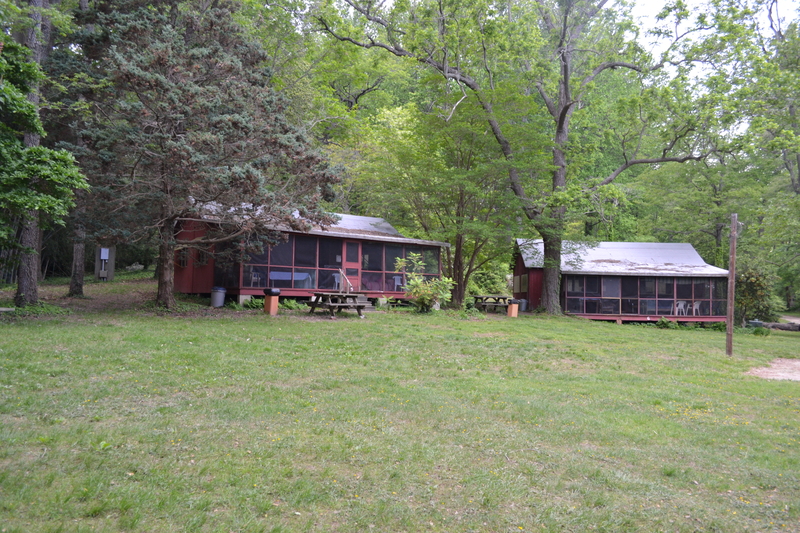 Cabins run about $240 per weekend. We haven’t taken the plunge. Besides we get a kick from paying $12 for some beach experience and zooming home missing the bay bridge traffic. I had a chance for a quick interview of the Smith’s daughter, Becky Barney now 50ish. She grew up in Matoaka with her four brothers and sisters, meaning there was no need to go to camp. The camp came to her. Each week would bring a new set of kids to play with. 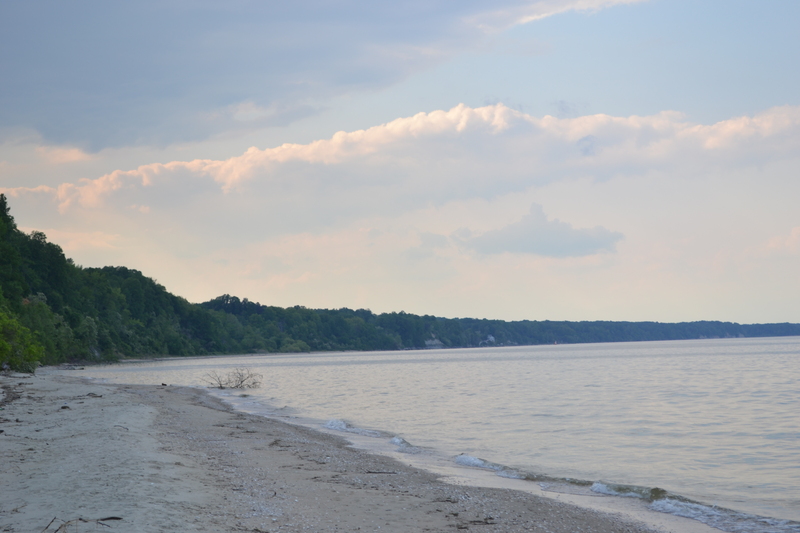 She also saw the demise of the Bay, the decline in fish and crabs and the runoff is on dramatic display on these cliffs as mature trees miraculous hang to nothing but topsoil jutting over the edge, before joining the woodpile that has since fallen over. Luckily Matoaka still offers a chance of what an old Chesapeake excursion felt like. 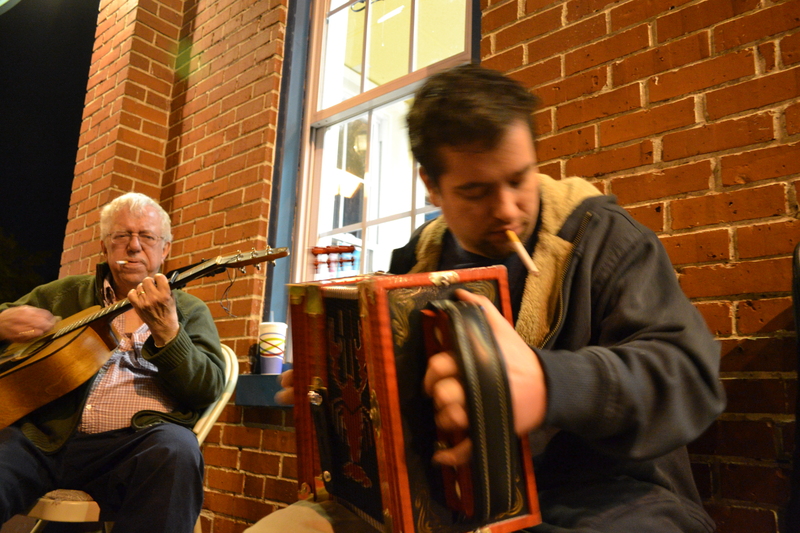 Jim Pettibone and his dad, Leron, are back playing the sidewalks, another indication that the street scene is alive and well despite the jolts of gentrification that’s been rocking Fells Point, the home base of The Baltimore Wire Service. Much bemoaning can be done about the sweep of upscale restaurants — that is if you’re into bohemia or maybe a slummer or worse one of those old timers who hold the good ole days over everyone else. 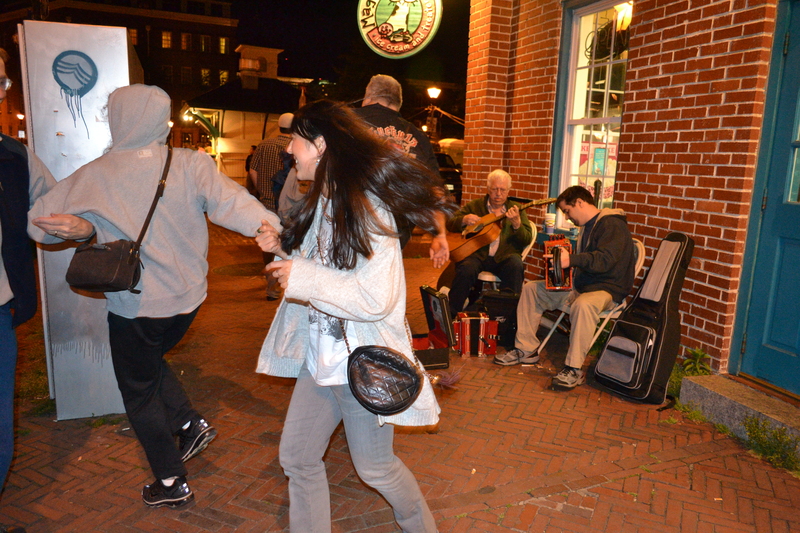 But hang with these guys and the new incarnation of Fells Point may just surrpise you. Sure there’s plenty of up-scaler, but there’s plenty of rif-raff of all walks and race. Best yet the cross-culture goes across all lines and everyone seems to be doing a Chagaul flaot on Baltimore rare mini-season, the flash in the pan moment when the air hangs heavy with blossuems just before Preakness, the annual drunk feast, and the blitz preview of sun burnt season. I’ve had the opportunity to bring my guitar and try to get down Leron’s timing. (His chord changes comes somewhere in the third measure between two and three, somewhere. I’m still looking for it). But most of the time I take advantage of the catalyst they create. Women dance. Men in cowboy hats, seemed find such H’ombres on the East Coast. Two years I noted Fells Point quiet diversity, but last Saturday and surely tonight, the momentum has kicked up a notch. Being a resident, I say this is a mixed blessing. More nutjobs yelling at closing time, but also I appreciate the joy and see it as a bromoter of the times. It’s a gauge that was tested back after 9/11 and a few y ears ago, there was too much peace and quite. 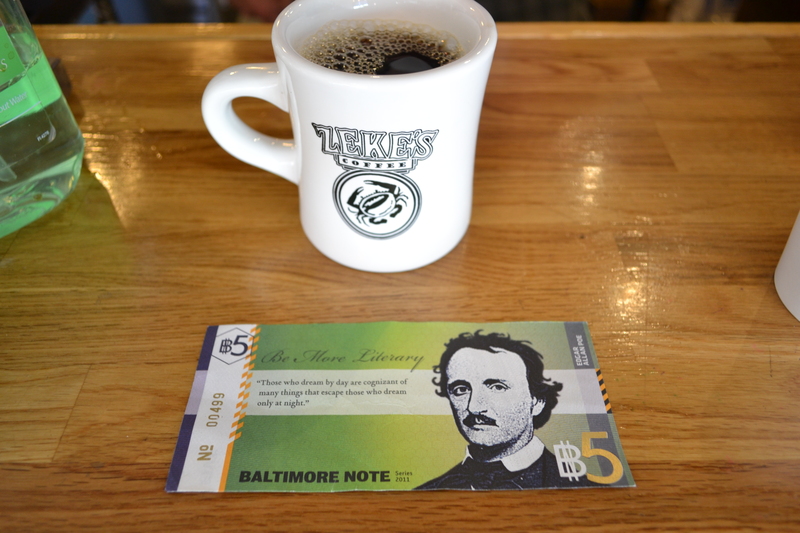 Now on these glorious early May week, Fells Point as much of the city, whether you’re dining outside Bs in Bolton Hill or Loittering in front of the Maryland Film Festival at the Charles, this is about as good as it gets in the City, before thea Heatwave comes that is a Baltimore Summer. Most boutiques, shops, eateries, cafes and joints in between are passive establishments, set up to receive you like a park bench or a public bathroom, the listening station at a music store. You go in, you wander, consume and walk out. But few with the mighty shingle out front are set up to instigate, and fewer of those actually get away with it. Minas, 815 W. 36th Street, in Hampden is one of those storefronts. Part boutique, part gallery, part toy store, part book store, Minas pulls off the modern-day emporium provocateur quite well. That’s mainly because of the laid back proprietor Minas Konsolas. The Greecian-ex-pat, Baltimore bounded since 1976, keeps a steady eye on his customers. Good with faces, he is, especially when he learns of their artistic habits. Writers and artists have gathered in his space for years. 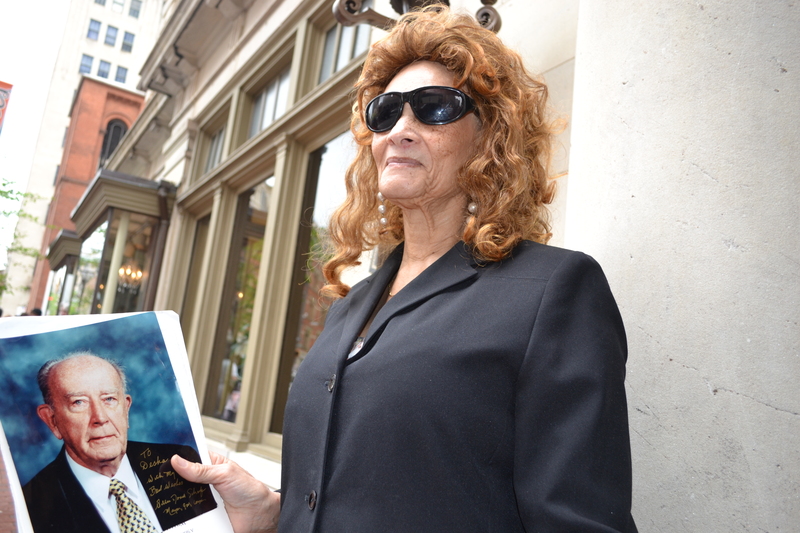 A reading every third Thursday 5 p.m. has become a Baltimore mainstay. His upstairs gallery exhibits usually have pluck, a much appreciative counter to the amazing assembly line of schlock that papers cafes and eateries around this town. Exhibit A is the current exhibit of James DuSel’s black and white photographs. Phainomena is the name, but the photos are black and white sprung from Leica, Rolleflex and a Linhof cameras of the 1930s. The old school look is well-earned and his subjects mundane, industrial, utilitarian work horses — the steel foot rest from a malt shop stool, a granite foundation, a chrome stack of nested chairs that I swear I saw somewhere (The Maryland Club or was it the Boy’s Choir in East Baltimore) and thought it would make a nice photograph. Light is stalked and captured, flared along a banister or snared in stainless gleam. And yeah, we get the point and DuSel’s mission statement, “I fully engage myself in the process, it uses my eye to measure the light , not a photocell. Thus I become part of my equipment, and my equipment becomes part of me.” Nice motto, but the proof is the artist’s vision sticks with you or at least with me as I found myself staring at a usurped train tracked installed to hold shopping carts at the Whole Foods down Mount Washington Way. Next up is Minas himself. 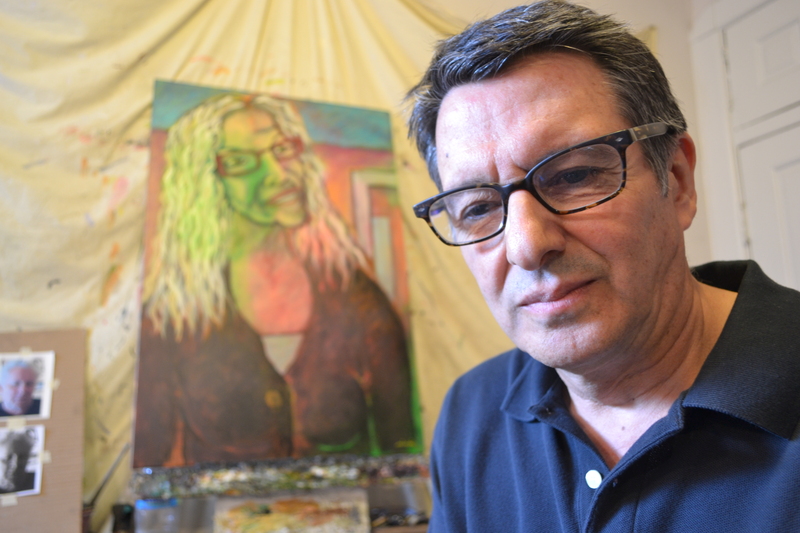 “It seems like I have been practicing for this the whole time,” said Minas, who took a frustrated portrait classes at MICA in the 1980s. This exhibited entitled, Interaction, is a big leap from his Masks that made a popular splash when exhibited in his shop two years ago. Of course he saying all this as he scrowls his art on his lap top. 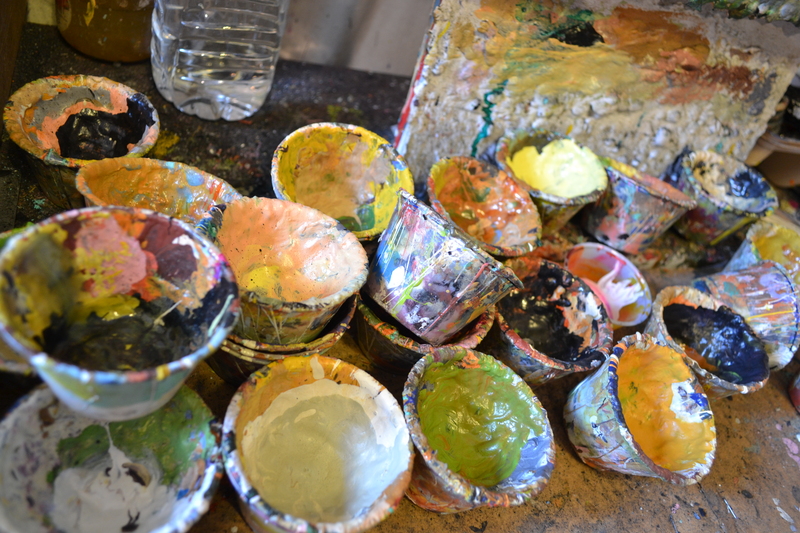 Minas realizes the irony, shuts down the computer and takes me to see the art live in his studio. I puruse his future offerings, but I’m struck most with the photograph pinned to his easel. His next subject. Wild hair and wild eyes. One of the Catonsville Nine. (Those Vietnam Protestors that grabbed national attention way back when). He comes in here, ” he says, pauses. Nods. I glance at the gent with the madcap hair and Minos with his subtle street wise concierge coiffe. This I got to see. The soul of William Donald Schaefer wasn’t necessarily in the speeches by the state’s dignataries from Senator Barbara Mikulski to U.S. Rep. (and always rumored mayoral candidate) Kweisi Mfume . 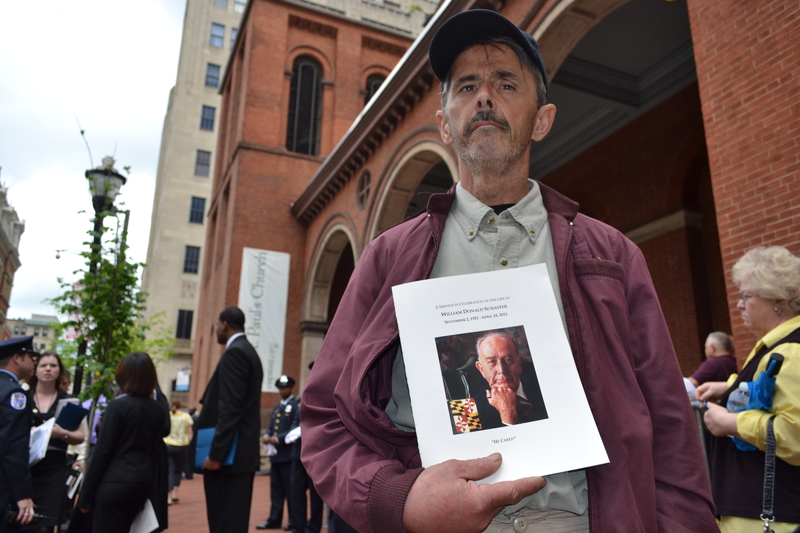 Try standing in the street outside St. Paul Episcopal Church on Charles and Saratoga streets. That’s where Schaefer prefered to linger anyway. 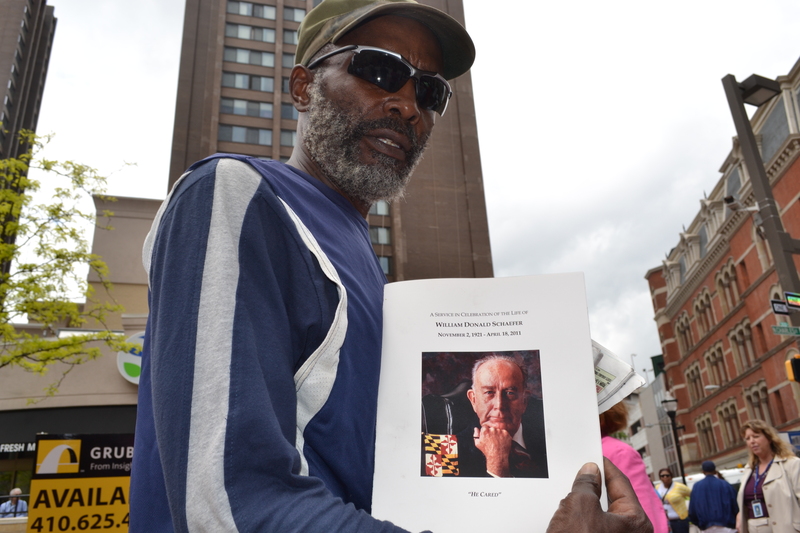 While he pushed for big changes in the marbled halls of government, he never missed a crab cake dinner or failed to loiter with “the druggies” as one woman observer put it, in front of Lexington Market playing the part of civic barker. Schaefer was all about impressing his impact one handshake at a time. This is where he seemed most comfortable in the oddity that is street life. Except the day of his funeral, the street of Baltimore failed to deliver its normally reliable panache. Honestly apart from the usual dignitaries and wanna-be dignitaries, there was a tumbleweed vibe, the hanger’s on in a ghost town as if they pack themselves in a Saloon in hopes of reviving the days long gone only to find the taps all dry. (See Scene in The Outlaw Josey Wales for further elaboration). And that spoke volumes in the same way when I went down and watched Martin O’Malley launch is Governor Campaign (last year) and saw a cluster of what seemed be paid employees and few bored government workers. Even then I tried to compare this wilted extravaganza to what Schaefer’s statewide spectacle must have looked like. But under bullying clouds going wild in blue skies, Schaefer got a light dusting of true outcome from The People that the Old Timey Pol used so well as a backdrop. 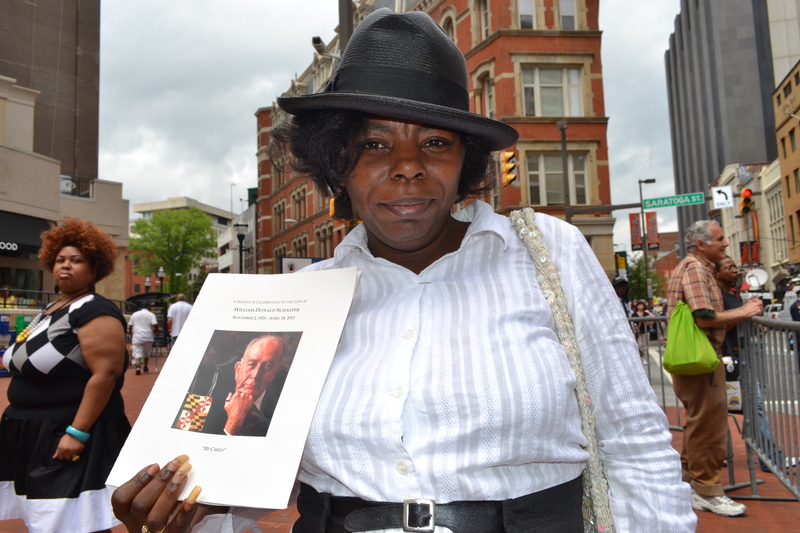 loitering, some people’s connections that drove them to take the day off to go to the funeral was dubious like one Patterson Park resident who remembers offering Schaefer a pair of vice grips when he his car broke down in a parade. 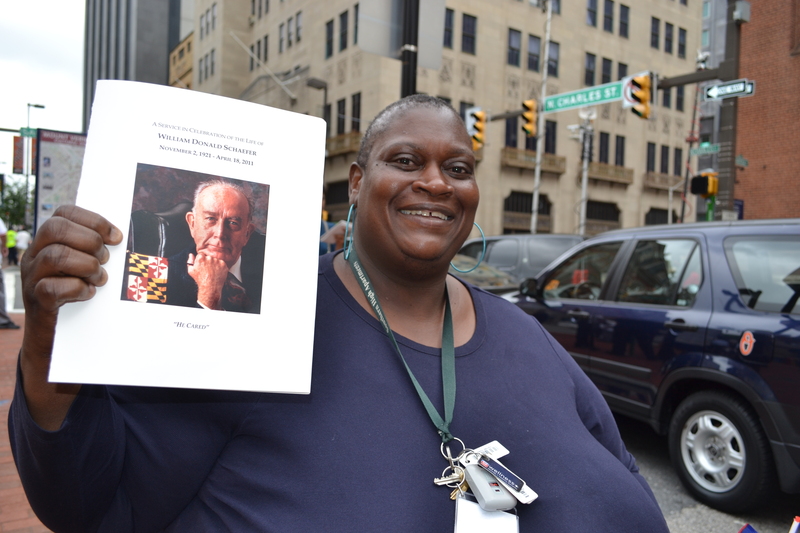 “He told me to run along.” And the repeating version of people down on their luck getting a job or public housing from Schaefer came off as if we were burying what James Smith declared, “The Last Don” not a public figure. But what really was telling was the great absence of people in the street. Factor in the clumps of media there were probably 50 people milling about and some of them were eating lunch. Sometimes it takes a death to realize that the change has been more sweeping than we had thought. Thomas Forsythe Sr. still a city worker, recalled when he started out as a mail room clerk fetching Schaefer’s breakfast.I would go to give him his change and he’d say keep it. Keep it. Put it in your pocket Do it now. Everything with him was do it now.”Schaefer tried to transfer the do it now attitude to the state government with mixed resulted. His gumshoe technique didn’t get a thorough translation in the bureaucratic mish-mosh of state government. But his point man Luther Starnes, officially titled was a community liaison, but Schaefer thought of him as Secretary of Hard Luck. All those letters,the desperate ones written by people who believe that head of state could actually do something — he would get those to sort out. Schaefer would send him ones with the Get It Done emphasis. “We never said this is a state problem or a federal problem, it was our problem,” Sterner said. 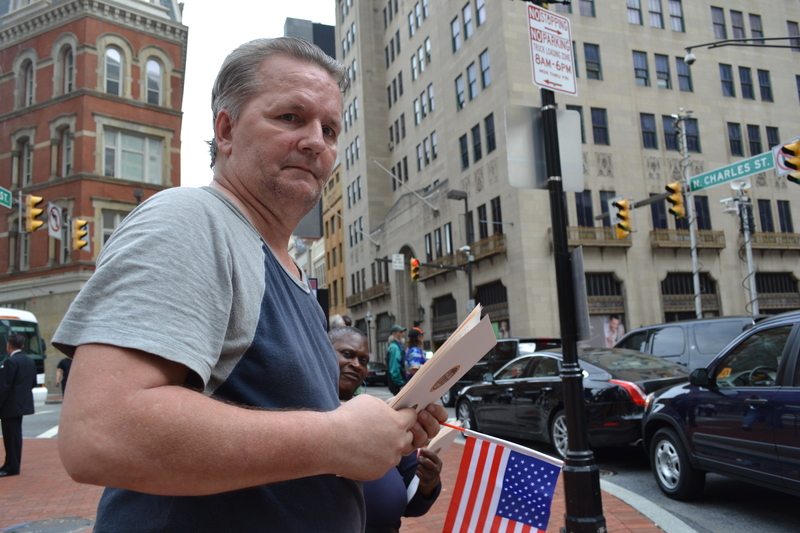 He recalled one time a Marylander-ex-pat and veteran living in Western Virginia and was getting nothing but hassles getting an official Maryland Flag from the Veterans Affairs. Starnes drove one out special for him. “No one ever heard about that, but these are the kinds of things he did,” he said. 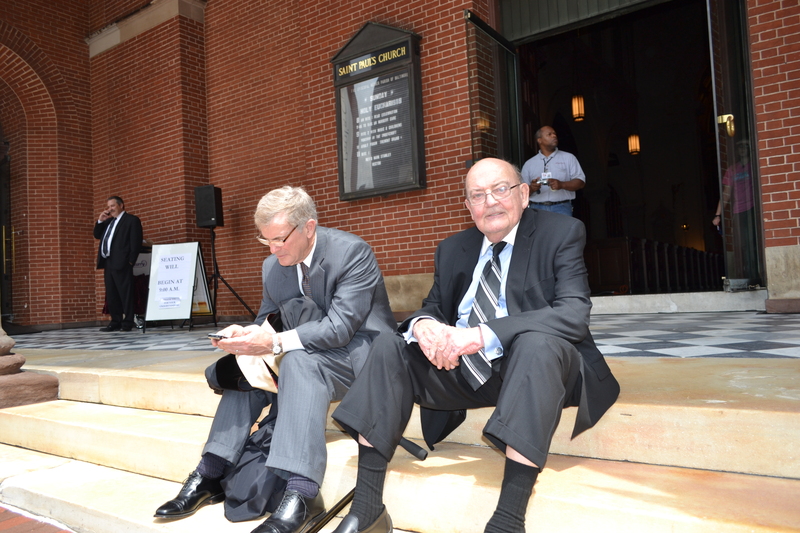 Starnes, (Right) Just after giving a eulogy.